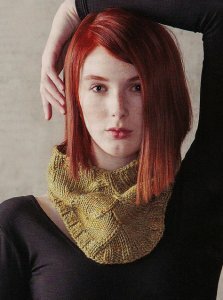 Taken from Knit Wear Fall 2012 Magazine: This lovely cowl combines unique shape with one-of-a-kind hand-dyed yarn for a simply stunning piece! Size US 10- 20" or smaller circular needles (or size needed to obtain gauge), stitch markers, and a tapestry needle are required but not included. Finished Measurements: 18" circumference at top, 26" Circumference at bottom, and 7" tall after blocking. Gauge: 15 sts and 22 rows over 4"